Weddings are our specialty at Daven Haven. We are teamed up with "Stone Creek Catering" (formerly Carey's Special Events & Catering) to bring to you the best Grand Lake has to offer in Wedding Receptions. Less than five minutes from the Lodge is a popular are "Point Park" where thousands of couples have taken their vows on a large dock over the waters of Grand Lake; with Mt. Baldy as their back drop. Daven Haven has all the information for reserving this area along with pairing you with one of Carey's experienced bridal consultants to begin making your dream a reality. Highly recommended by locals as the premier caterer in our area. Our comfortable banquet room seats up to 100 guest. 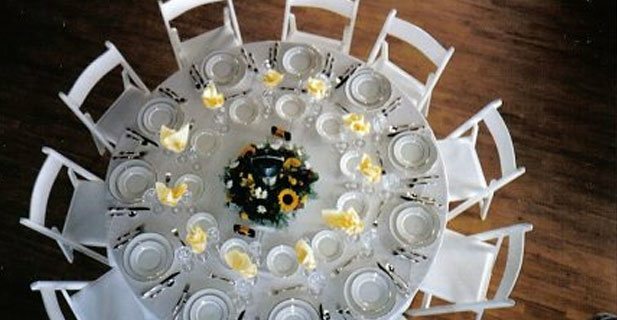 If a head table is not desired there is seating for up to 120 guests. Our log beams bring a feeling of warmth and comfort to this room. Outdoors our garden patio reception area will host up to 200 with space available for tents. With the summer season in full bloom the, colors, flowers and warm mountain breeze make this out door venue alive and vibrant. Our quality of food, service, and presentation is unmatched in our area. From a simple Barbeque or Mexican buffet to an elegant plated affair we are the best! A perfect wedding, The Daven Haven Lodge will guide you every step of the way from the planning process to the big day itself. Beginning with initial consultation and Menu planning, to pairing you with Florists, Music professionals, Photographers, Ministers , Transportation, and guest activities. We are also available for Rehearsal dinners, Bridal Showers, and Post wedding Brunches. As you start planning your big day, a consultation with our staff is the first place to start. Our wedding specialists will advise you on space and date availability, ceremonies and receptions, offer ideas and of course answer those burning questions. Call Carey Barnes at (970) 627-8144 or email at carey@stonecreekcatering.com, we will be happy to send you our information on weddings at the Daven Haven Lodge prior to your first meeting with us. At our first meeting we will advise you of cabin availability with rates for your out of town guests. The number of cabins required and the time of the year determine guest room rates. Visit the Cabins page now! copyright 2019 Daven Haven Lodge. All rights reserved.